"My plan should not be viewed in a vacuum, but in comparison to the continuation of the status quo," Texas Gov. Rick Perry told an audience in South Carolina on Tuesday. 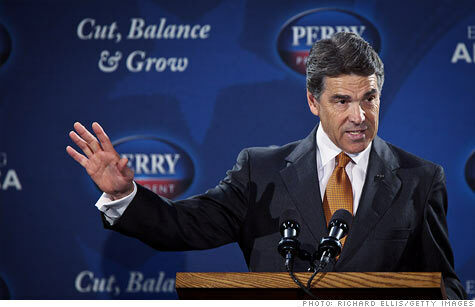 NEW YORK (CNNMoney) -- Rick Perry has said he wants to scrap the tax code and make taxes simpler. That may be what he wants. But what he proposed on Tuesday is to keep the federal tax code intact and add an optional flat tax. Inherently that makes the tax code more complex, not less. The GOP presidential candidate's "Cut, Balance and Grow Plan" would give taxpayers a choice. "Central to my plan is giving every American the option of throwing out the three million words of the current tax code and the costs of complying with that code in order to pay a 20% flat tax on their income," Perry said in a speech in South Carolina. If families making $500,000 or less choose the 20% flat tax, they would get a $12,500 standard exemption, and they would be allowed to deduct mortgage interest, state and local taxes, as well as charitable contributions. Families who earn more than $500,000 would not get any of those tax breaks. But everyone under Perry's flat tax would enjoy tax-free capital gains and dividends. The estate tax would be eliminated as would the requirement to pay taxes on a portion of one's Social Security benefits in retirement. So where would Americans be better off? Under the current tax code with its hundreds of tax breaks and six tax rates, or under the Perry flat tax with one rate and four tax breaks? Generally speaking, it's fair to assume that the wealthy might benefit most from the flat tax. That's because investment returns and dividends tend to make up a bigger share of their income than their salary. And what wage income the wealthy do have may be taxed less at a flat 20% than under today's graduated rate system where their top rate is 35%. Lastly, eliminating the estate tax would be a boon for their heirs. "The rich will save a lot," Roberton Williams, a senior fellow at the Tax Policy Center, told CNN. 0:00 / 5:26 Texas governor fed up with D.C.
As for everyone else, Williams said, he expects they'll have about the same tax bill as they do today or perhaps a little less. That's because it's not clear how long people will be given the choice to file under one system or the other. "Could you switch back and forth or is it a one-time decision? If switching is always allowed, everyone would always pay what they pay now or less," Williams said. Lots of other questions remain. For instance, will the value of the deductions that Perry's flat tax allows be gradually phased down as one's income grows closer to $500,000? Or would employer-provided health insurance benefits -- which are a form of compensation -- be taxable to employees under the flat tax or would they remain tax-free as they are today? The nonpartisan Tax Policy Center will try to get more clarification from the Perry campaign so that it can analyze who stands to benefit the most and who stands to benefit the least. Another big unknown is the plan's impact on the budget. Perry says his plan would raise the same amount of revenue on average as the country has raised annually over the past several decades. The Tax Policy Center's analysis will also shine a light on how realistic that assertion is.